Beach scenes have always been a major part of my life. I grew up on the north shore of Long Island and we raised our family there. During the warm months, we were spoiled for choice between the endless sandy expanses of the south shore and the intimate coves and harbors of the north shore. The harsh New York winters gave me a special appreciation for all things warm and tropical. We'd venture out of the frigid northern weather for two weeks every February and enter the magical, balmy, tropical world of the Caribbean or the island paradise of Hawaii. The four of us played like children in the effortless environment of those magical places. I can paint these beach scenes at the drop of a hat as it's somewhere I long to be. All my tropical paintings start in my imagination and flow out of my fingers onto the paper and give me such joy. I hope you can feel similar happiness when you choose them. Have you ever stood at the water's edge, spread your arms wide and let the sea breeze flow over you? I've tried to capture that calming experience in this watercolor. It's a meditative painting for anyone who delights in being near the sea. Capture this euphoric moment and frame it in a 5 x 7 frame. Walk along the sandy path past this palm shaded seaside cottage and wet your toes in a turquoise sea. 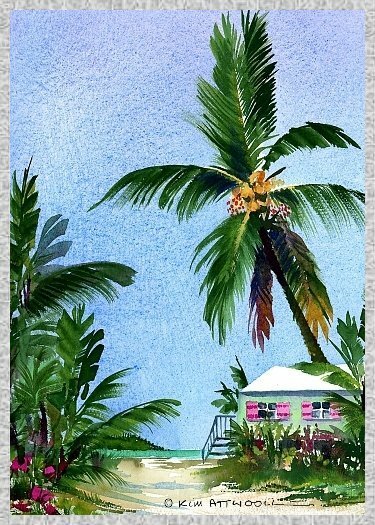 This was painted in the Florida Keys where relaxing is unavoidable. 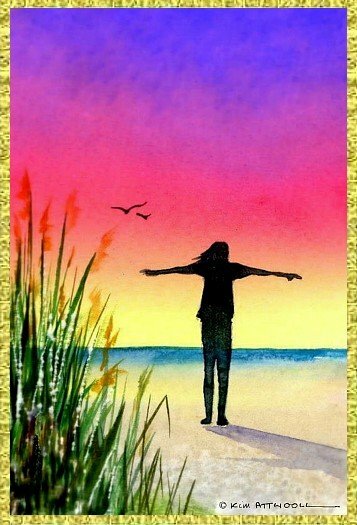 You can enhance this card with brightly colored flowers or sparkles on the sand. I love bringing sparkly footprints out of the picture and onto the card, leading your eye in and out of this holiday place.